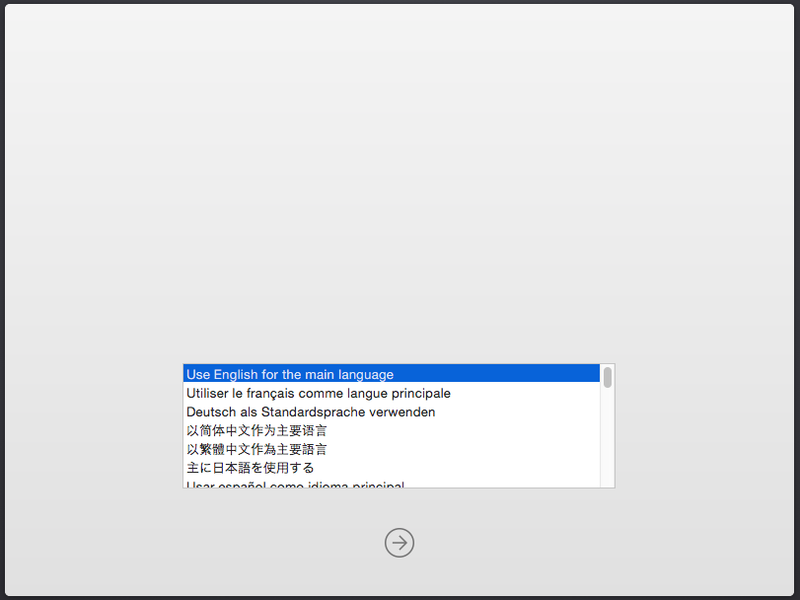 What about an El Capitan VM? peter_sm – wouldn’t have gotten this working without his expertise and teamwork! The authors in the references below – thanks for the guides. 64 Character OSK Key (You will need a real Mac to get this and I will NOT provide one). Read the references below for more information on this. Download the Yosemite.app from the Mac App Store. move to the directory where you want your Mac OS X image to live. You can use -v for a verbose boot which can aid in troubleshooting. If you get a kernel panic here, If your terminal is filled with usb-kbd: warning: key event queue full and the keyboard doesn’t respond, just try again. 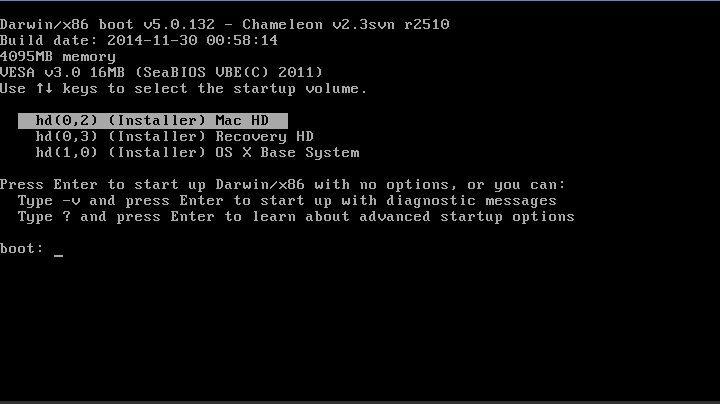 While the keyboard works reliably once OS X boots, it sometimes has problems on the Chameleon boot prompt. Hopefully the installer should just start right up. Continue with the installer and start up Disk Utility to partition your drive to Mac HD (The mouse is going to be laggy until we get everything installed) Hint: Move the mouse faster to get the cursor to move farther. Close Disk Utility and install to the disk partition you just created. The installer will reboot and put you back on the Chameleon prompt. 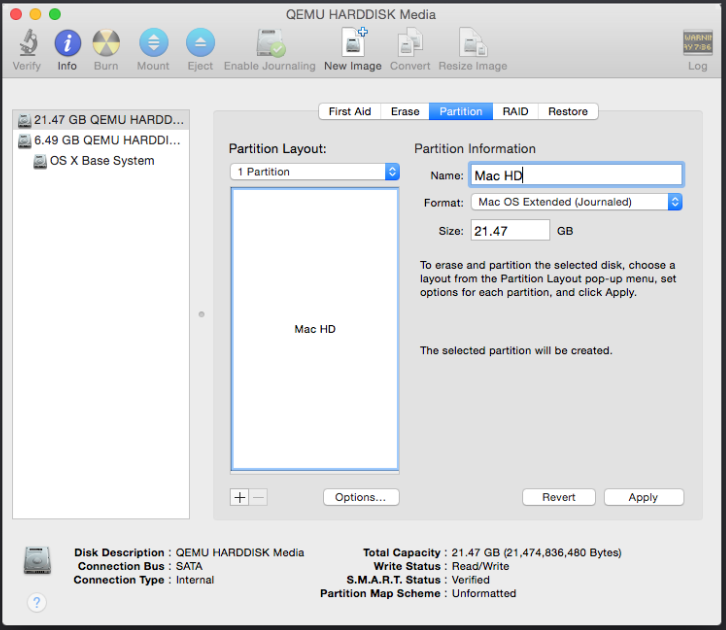 Choose the (Installer) Mac HD partition to continue with the install. The install will continue. I skipped setting up an Apple ID and registering. Now you should have a mostly functional Mac OS X installation! Most KVM guests can make use of the tablet device to synchronize the position of the mouse with it’s position over the VNC window. OS X, unfortunately, does not support this device. If you enable OS X’s internal screen sharing and use it in place of QEMU’s VNC server then mouse positioning works perfectly. 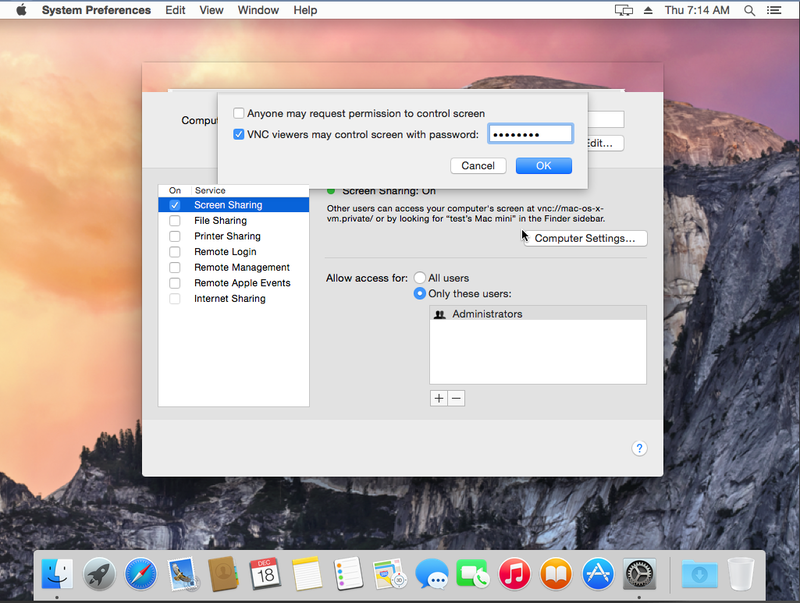 Go to “System Preferences” -> “Sharing” -> enable “Screen Sharing” -> “Computer Settings…” -> add a password. Now go to “Computer” -> “Mac HD” -> create a new folder called “Extra”. Open a text editor and save the following as org.chameleon.boot.plist (or copy the file linked above into your created Extra folder). Now start the VM and you should be able to log into the app store. The virtio network driver does not work on Yosemite as of this post. I have been using the e1000 driver. Disclaimer: Your motherboard & CPU must support VT-x & VT-d and be enabled in the bios or you will not be able to passthrough PCI devices. You will probably want to try and get a GPU working, but that is easier said than done. Mac’s are very picky about which GPU’s work. Google is your friend. Thanks for the instructions. I’ve posted for help on the unRAID forums, but maybe you can help me here. I was able to get everything up and running. I shut down the VM at step 15, and I can’t get it to reboot, webGUI just says error. My other VMs continue to work fine. I’ve destroyed the VM and rebuilt it from scratch. I’ve created new disk images. I’ve rebooted the server, but still no luck. Any idea what could be up? ssh into unRAID and type “virsh start OSX-Yosemite-10.10” or whatever you named your VM. That should give you a better idea what is going on. This is a great write up, and hopefully it can be more broadly disseminated to the unRAID community (not sure how they feel about getting tangled up in the Apple VM web). There are a few typos above that are causing some problems. 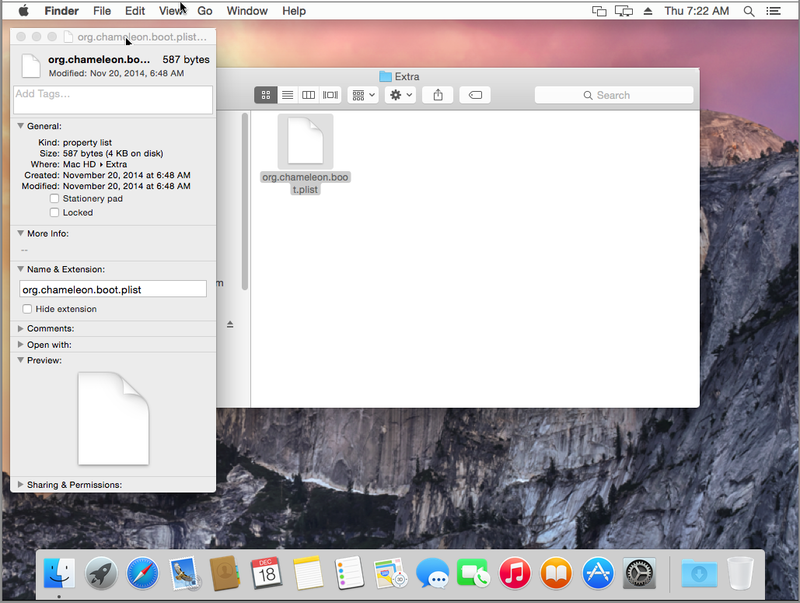 Also, the link for Mac Files at the top doesn’t work. Thanks again for the great write up. 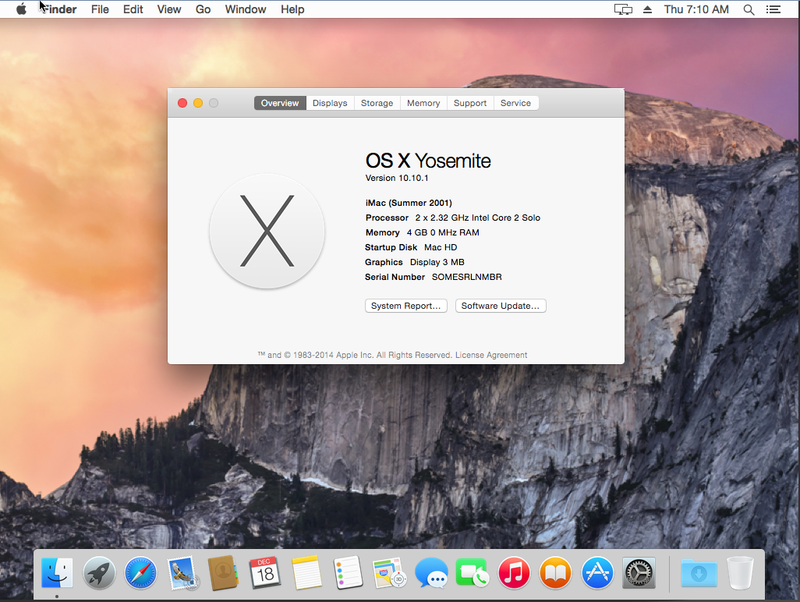 I’ve got a Yosemite VM up and running again on unRAID 6. Thanks for the feedback! Made the changes to the guide above. I’m glad you have it up a running. Hello there – thanks for this awesome guide! I am trying to get this to work on a Ubuntu box running standard WebVirtMgr on top of libvirt since I have no need of any of the other features of unRAID. Sadly, I am not able to get Yosemite to actually install on this build. Has anyone managed to get this to install successfully on anything other than unRAID? I’m thinking perhaps there are kernel differences – may try building a git pull of the latest kernel or similar but this seems very strange that you guys are able to get this to work so easily. What version of seabios is being used? 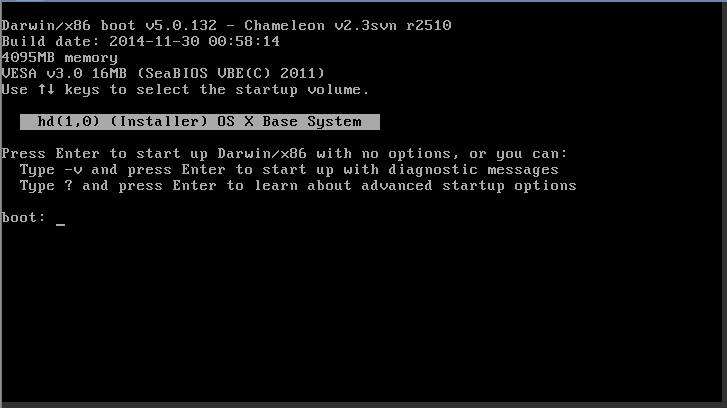 The “EBIOS read error: Error 0x0c” errors come from chameleon, which talks to the bios to read the disk. Hopefully that helps – It looks like 1.7.5 is the newest major release but perhaps a patchset is needed? There is a 1.7.5.1 – and I did 1.7.5 also; and qemu 2.1.2 & 2.2. I suspect unraid have them older. No, I had Maverick working for months and still do, and had not had any luck with Yosemite; have the same EBIOS problem. unRAID seems to be quite old linux-based platform but I had not any luck fnding out what it ships. There is an msr error which, if you follow the bread crumbs, corresponding to Yosemite trying to do CPU frequency scaling. I suspect it tried to query the CPU for CPU features first. Well, my CPU can do frequency scaling, but qemu/kvm’s emulation of getting at the frequency scaling status fails. with ignores_msrs set to zero (default), the darwin kernel crashes right away, hence the reboot; if set to 1, the kernel would continue to boot, but panic when some drivers (the IOFamily) tries to actually set CPU scaling. This possibly explain why different people experience different things. It depends on CPU features – which depends on how old/new your CPU is, and especially if you are on a laptop (laptop CPUs often have that feature). @Hin-Tak Leung – have you gotten past the “system uptime” hang? I ran the echo 1 command, but can’t boot beyond that. Running ArchLinux on a Lenovo TS140 w/ i3-4130. I get the 0x1999 errors when running “dmesg | grep msr” after the system uptime hang. Great writeup! Only issue I found was that the copy of chameleon_svn2510_boot from your Mac_Files.zip doesn’t work, the VM would just loop at the boot screen and not be able to find a boot source. The copy from insanelymac worked fine. Superb guide! I can get everything going, but my VM hangs on the Apple Logo screen when booting for the first time. Any ideas? Sounds like this is because of an AMD CPU. Not sure how to trick OS X into thinking you are running an Intel CPU. i.e. adding the vendor option within the section. @Tophicles and I were working on this on the unRAID form. We had tried the above but it wouldn’t start. After a bunch of trial and error putting the following at the end of the XML appears to have worked. Could it be that the normal VM shutdown through the unRaid VM Webgui does not work with Mac OS? Well still haven’t figured out a way to get unRAID to shutdown my OS X VM from the unRAID KVM GUI. I am guessing OS X doesn’t understand the KVM ACPI commands it is being sent. If I issue the command “virsh shutdown OSX-Yosemite-10.10” in a SSH session nothing happens either so I don’t think it is the unRAID web GUI. If anyone has had any success on getting OS X to shutdown or restart via any virsh method I would be very interested in hearing how you accomplished this. Good to know that i am not the only one with this issue. 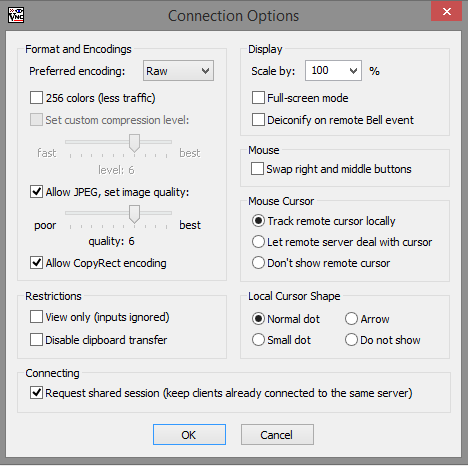 Dont know maybe there is a way by using a custom DSDT Table in conjunction with Chameleon? I know there is a fix_shutdown option in DSDT, but i dont know if that would change anything. Not sure, but let me know what happens! Hi, thanks for writing this up. I was able to successfully installed Yosemite using your steps. But I find mouse navigation is really sluggish. Although I have no issue passing through my NEC USB 2.0 and 3.0 cards to other Windows VM, I am having issue passing through to Yosemite. Is there any additional step that I need to do to make it work? I am setting this up on Arch Linux, btw. Here is my script snippet. I have comment the GPU passthrough lines until USB passes successfully. Step 04 #7 & #11 deals with the laggy mouse, Step 05 is the way I passed through my USB mouse & keyboard and Step 06 is how I passed through my GPU. I’m having problems on the #Kernel part of the first step. I am using pacifist and have no problems with the program. I am on 10.8.5 while working on prepping the ISO. When you say “With Pacifist browse to /System/Installation/Packages/Essentials.pkg”, do you mean to browse to this location on the ISO that we have made for Yosemite or to browse to this location on the current mac that one is working on to get the ISO ready. I have browsed to this location on the yosemite ISO, however there is no Kernel. I have also tried to browse to this location on my current OSX install on the laptop I’m using to try and get the ISO prepped, but there is no such location (on 10.8.5 and have hidden files set to show). Any input would be greatly appreciated. Everything up to this point has been smooth sailing and I’ve been scratching my head over this for about an hour. Are you using the OSX.app that was downloaded from the Mac Store? Yes, it’s a download of the Install OSX Yosemite.app from a few months ago, which I’ve then converted into an iso as per your instructions. I’ve booted from it, created a Mac partition, but then when I use the ‘Reinstall OS X’ option from the OSX Utilities Menu, I get the “This is not a supported method of installing the operating system.” error. Just tried the “Reinstall OS X” option and got the same message. I am not sure how to get past this but it almost certainly is a limitation/safe guard for Apple. Best bet is to create a new osx.img file and start from scratch if you want to install OS X. Then I would save a backup of your osx.img file that can be used as a “save point” if you ever need a fresh install. I’ve created a new img file and still getting the same results. I’ll try downloading the Installer again. Installed without issues after re-downloading the Installer. Has anyone tried upgrading to OS X 10.11? Nope, probably won’t try for a while. If you try, report back and let us know how it went. I would make a backup of your current OSX.img file first. Yep, it got stuck installing it after the first reboot. Did you install from scratch, or upgrade an existing working 10.10 installation? I just tried to upgrade. maybe a clean install would work? I don’t have to time to try it right now but maybe over the weekend I can try and report back here if someone doesn’t do it first. I’m guessing your going to need an updated bootloader that supports “El Captain”. It looks like this one is updated with the OS X 10.11 but I forget how I got the .boot file from it… My harddrive that houses my OS X VM just started having issues so I am attempting to backup my VM images from it now. Until I get that done I won’t be able to mess around with this. I was able to successfully upgrade to El Capitan using these steps. – once booted back into Yosemite using the Clover bootloader, download Install OS X El Capitan Application from the Mac App Store. When complete, the app will open. Please note, the Application will disappear after use. 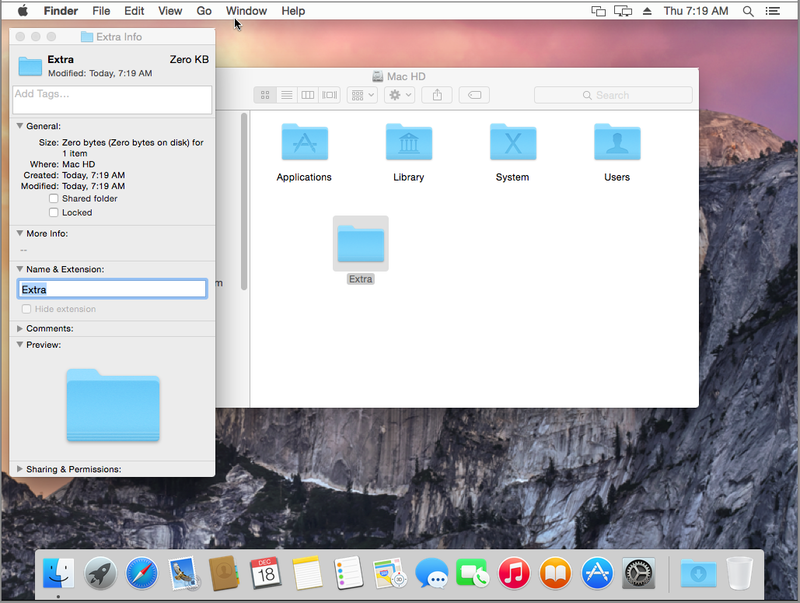 – Choose Yosemite system drive for install (Example: Macintosh HD). When complete, the computer will automatically reboot. – When Clover boot screen appears, choose Boot OS X Install option (Example: Boot OS X Install from Macintosh HD). Choosing your system drive will go back to your previous installation without updating. 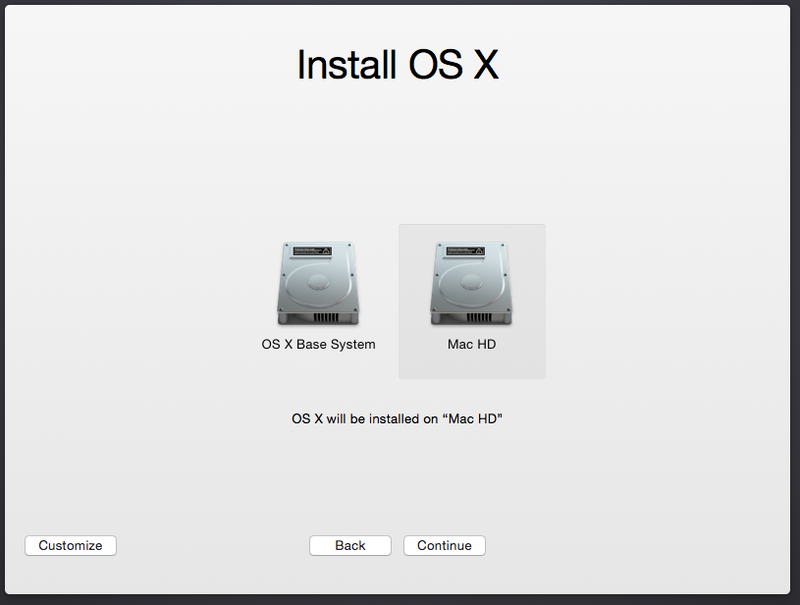 – Complete the OS X installation process. When complete, the computer will automatically reboot. – When Clover boot screen appears, choose Boot Mac OS X option (Example: Boot Mac OS X from Macintosh HD). The computer will then complete the update. Sure, I have successfully installed 10.7 through 10.11 as a KVM virtual machine. I would suspect you could get the older ones working if you really wanted to. Have you ever tried setting that up on a QNAP ? I’m having some trouble. Every time the vm starts, I get past the boot options screen then immediately run into a kernel panic. “Unable to find driver for this platform \”ACPI\””. Anyone else having this issue? I can paste the stack trace if necessary. I’m using unraid 6.2, which did change a lot about how virtualization works, so maybe that’s having an effect?